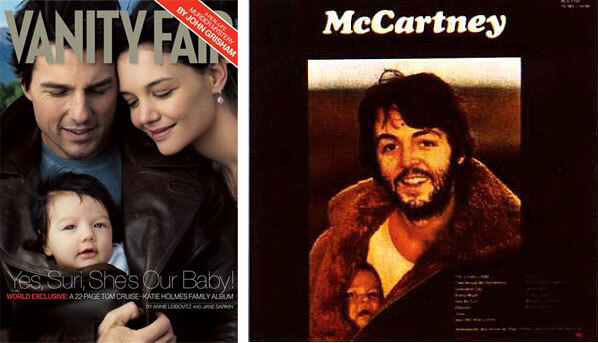 On the right, Paul McCartney with his just-born daughter Mary, photographed by his wife—and the mother of the baby—photographer Linda Eastman, in 1970, for the back cover of Paul's first solo album, McCartney. On the left, the poor, confused Tom Cruise and his wife Katie, with their baby, Suri. A phrase in the original post read 'On the left, the poor, confused Scientologist Tom Cruise and his wife Katie, with their baby, Suri'. Now 'Scientologist' has disappeared. Is scientology so powerfull ? In the protests over the Danish cartoons last year, Ibn Warraq said he witnessed a man in an angry protest mob carrying a large sign that read (in Arabic), "Behead all those who say Islam is a violent religion!" Scientology makes you leap up and down on couches. Heap big magic. Me no mess with. I don't recall - did Tom ever actually marry Katie? So Mike, when are you going to blog on the Self-Censorship? "So Mike, when are you going to blog on the Self-Censorship?" I did, but then I censored it. Many Scientologists are embarrassed by Cruise at the moment. Yes, L. Ron Hubbard was a photographer - a lousy one! He was also a collector of cameras - an obsessive one. With the hundreds of millions of dollars that he got from the Church of Scientology, he bought every expensive camera and lens made in the world, but it didn't help him in the slightest to make one original photograph. I was there, I knew him and saw his photographs. He couldn't learn to take good pictures because he had to already know everything. That made it very hard for him to learn anything. He was surrounded by yes men telling him what a genius he was all the time, so he never got to hear anything but fawning praise for everything he did or said. That would warp even the best of men, and Ron couldn't get enough of being uncritically adored. Anything less than total adulation was cause for ejection from his circle. A real 'ultimate ego' trip that ended with him dying like Howard Hughes did. Not a pretty ending. So please, call L. Ron Hubbard a 'camera collector and user', not a photographer. As a photographer, I was mortified to hear the praise that his PR people heaped on his photos.